I am thrilled to post this painting, my birthday present, by the great designer, artist and painter, Denis Carre. Denis and his wife Claire are wonderful friends of mine living in Paris with their two sons, Max and Charles. Charles may be coming to NYU – I would love to show him the “Big Apple”!! 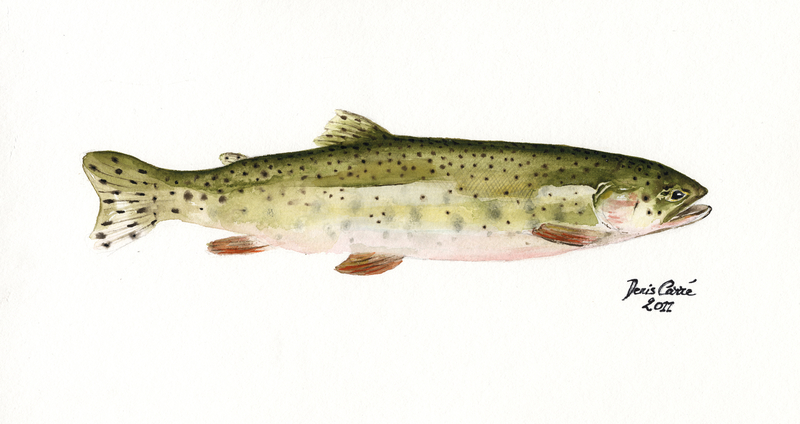 Here is the painting, a cutthroat trout. I LOVE it!! Last Sunday, I performed Buxtehude’s ” Jesu Meine Freud und Lust” with Rick Errickson and the Holy Trinity Bach Players to celebrate our new CD “freud und lust“. The official release date is December 12th 2011! Make sure you pick up a copy! Have an opportunity to do a concert today to celebrate Saint Cecilia’s Day (also my birthday) at Trinity Church. TENET joins forces with Trinity Wall Street for a celebration surrounding the patron saint of musicians. An all-star cast will be performing the music of Henry Purcell, one of England’s most celebrated and beloved composers. TENET will offer three ODES along with instrumental works, and arias for voice and trumpet. Would love to have you join us at 7:00pm at Trinity Church!! Per an earlier blog, Gregory Spears “Requiem” CD release is today at Galapogos, in Brooklyn, NYC. The Galapogos has a river running through it. Very cool!! So excited about this CD! You can purchase this amazing CD at itunes. “The opening prelude sets the tone for the rest of the work. The sonics are marvelously suited to the music: the natural reverb on the two harps gives them the incisive presence of a piano, but muted just enough to enhance the murky ambience. The voices enter in counterpoint, with an unexpectedly agitated, clustering, seemingly argumentative crescendo, the last thing one would expect to hear in a “Requiem Aeternam:” it’s jarring, to say the least, and it packs a wallop.” You can read the rest of the article, here. Requiem is now out on New Amsterdam Records. I was in Houston on Saturday, October 29th performing with the Houston Chamber Choir and their premiere of Giovanni Colonna’s Vespers. What a great opportunity to sing some beautiful music!! There was a free pre-concert lecture presented by Robert Simpson and Dr. Anne Schnoebelen at St. Philip Presbyterian. It’s an incredible true story. A composition, created in 1694, languishes for centuries in the archives of Westminster Abbey and the Central Library of Zürich. Thanks to the enterprising editorial work of musicologist Pyrros Bamichas, Psalmi ad Vesperas (1694) by Italian composer Giovanni Paolo Colonna is now available to modern performers and will, in fact, receive its United States premiere by the Houston Chamber Choir under the direction of Robert Simpson. The Vespers was written in the last year of Colonna’s life for a grand festival at the Basilica of St. Petronio in Bologna. Colonna’s contemporaries called him “the Orpheus of our century,” and the very fact that copies of the Vespers traveled to England and Switzerland attests to its popularity. Dr. Schnoebelen, the artistic advisor for this concert has spent her career studying Italian sacred music of the 17th century and she is recognized as the world’s foremost authority on the music of Colonna. She served as musical advisor to Robert Simpson in the Houston Chamber Choir’s performance of Messa a Nove Voci Concertata con Stromenti (Mass for Nine Concerted Voices with Instruments) by Colonna for the Choir’s 15th Anniversary Season finale,Venetian Vespers and continues her collaboration with the Choir on Psalmi ad Vesperas (1694). Check out this article by HoustonPress about the concert! 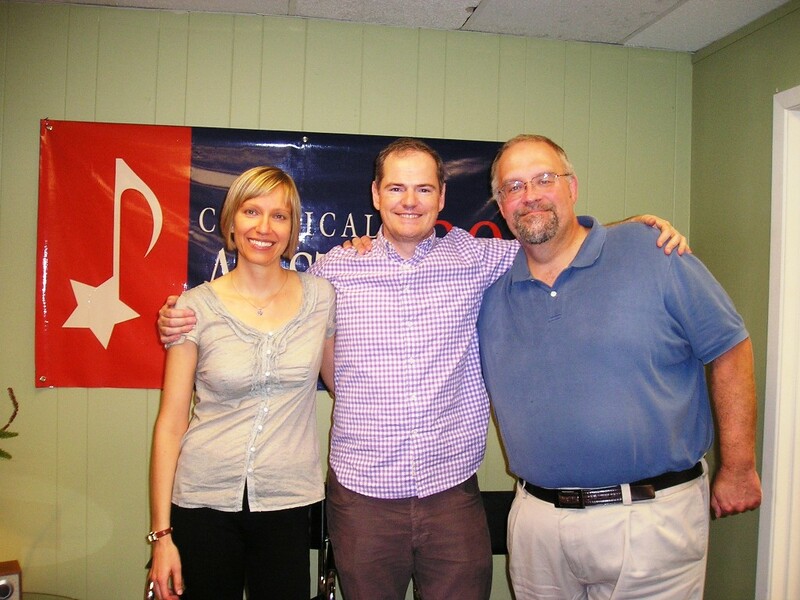 Here is a photo taken before my interview on KMFA, a classical music radio station in Austin. The interview was with Sara Hessel on her “Ancient Voices” show. I really enjoyed re-connecting with these folks!! In the photo, from left to right, is Sara Hessel (the host), me, and Keith Neisler (the program director). You are currently browsing the Ryland Angel blog archives for November, 2011.